Today Wednesday, July 18, Roberts Street closed between 2nd Avenue North to Roberts Common Parking Ramp to vehicle and street parking. The full road closure on the south portion of Roberts Street will allow crews to begin with roadway removals. This is a continuation of the first phase of the Roberts Street reconstruction and water main improvement project work that started with underground and roadway reconstruction work on 5th Street North. During the dates of July 19 – 21, the suggested detour route around the construction activity and event related road closures will be use of 7th Street North. Broadway is currently closed between 3rd Avenue North to 7th Avenue North for Downtown Fargo Street Fair. After the event concludes Saturday evening, the posted detour route will be via Broadway. 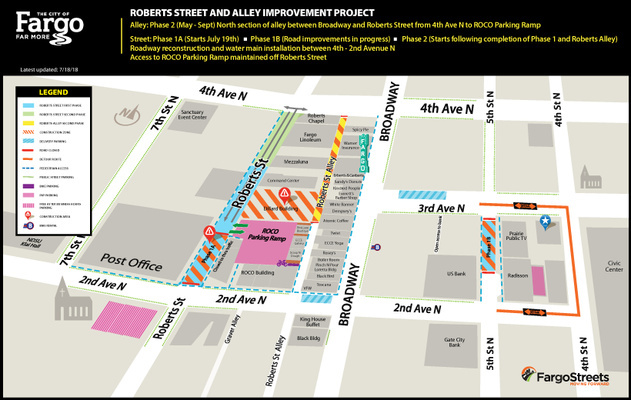 The project work on Roberts Street will be completed in two phases to maintain access to area buildings and parking ramp with crews working south to north. During specific project work on Roberts Street, contractors may need to reduce access lanes from two to one open lane into the parking ramp. Street parking will be open for local traffic in the north portion. The number of available spots will vary as construction progresses. Roberts Street intersections 2nd Avenue North and 4th Avenue will remain open to cross traffic and other north/south turning movements. Currently, the north ½ block section of 5th Street between 2nd Avenue North and 3rd Avenue North is fully closed to drivers and street parking is temporary unavailable. Crews completed the street paving and concrete is curing until it reaches its design strength. Pedestrian access is maintained on the east side next to the building entrances and temporary exit from the bank drive-thru maintained to 2nd Avenue North. The Roberts Alley project continues to progress, and crews are active on the north half of the alley. Crews have completed all of the underground improvements and will begin to prepare the alley for paving operations in the next phase of work. The new south portion of Roberts Alley is busy with traffic and open to all forms of transportation as well as deliveries.